Today I tried something new...I tried "juicing" for the very first time. One of my absolute favorite places in the world, Williams-Sonoma, invited me to participate in their "Juice Week", so naturally I was thrilled to participate (meaning I said yes)! Well, there might have been a little happy dance involved as well! Their theme is "Not Your Average Juice" which was THE perfect theme for me to partake in since I am a low carb, "no added sugar" foodie and juicing is something that I haven't experimented much with since many juices can be higher in carbs and sugars. So today, I was anxious to see if I could come up with a delicious, refreshing, low carb juice. I wanted it to be both healthy and delicious. Ironically, it just so happens that a few months ago I happened to have purchased a Vitamix blender from Williams-Sonoma. Believe it or not, until today, I had not actually used it (what's wrong with me?!?!)! So, it was only fitting that my Vitamix's "maiden voyage" was taken by participating in Williams-Sonoma's "Juice Week"! In addition to carrying the Vitamix blender like I purchased, Williams-Sonoma also carries a great selection of other juicer options as well. 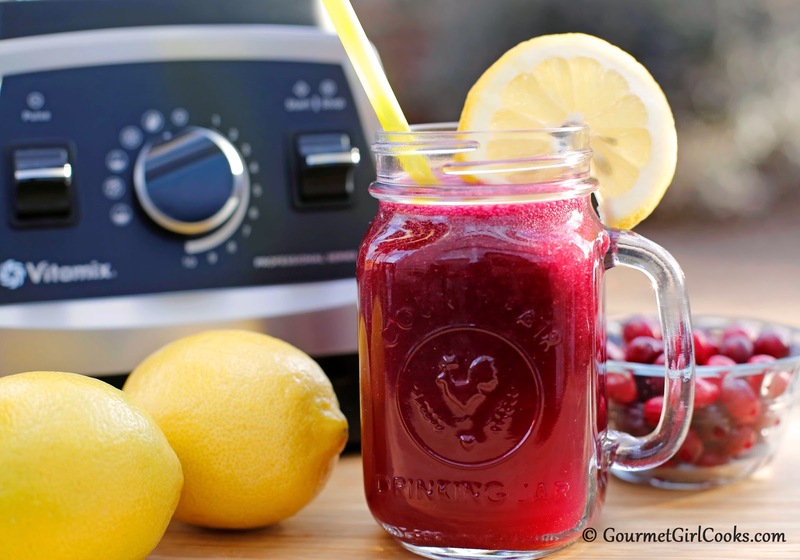 This juice was so simple to make and absolutely amazing! 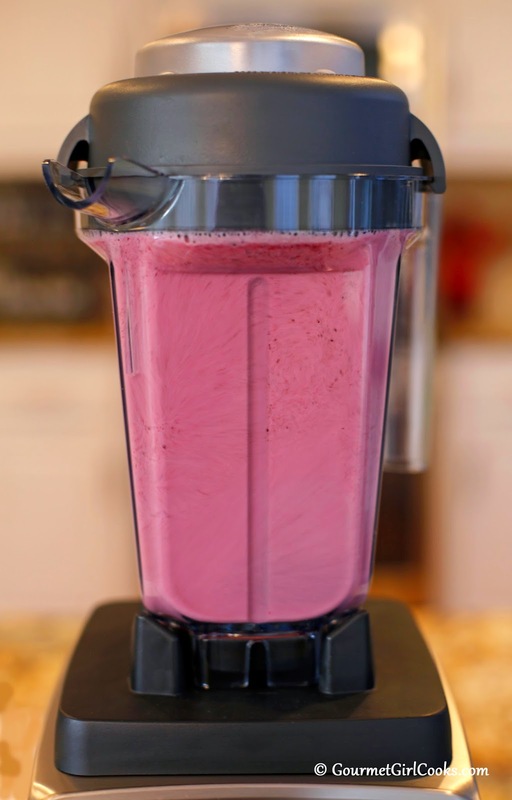 I really enjoyed using my Vitamix so much that I actually feel rather stupid for not trying it out sooner. It was actually fun to use! My version has a pre-programmed clean cycle which made cleaning it a breeze (it basically cleans itself). I used another pre-programmed "juicing" cycle to make my juice. 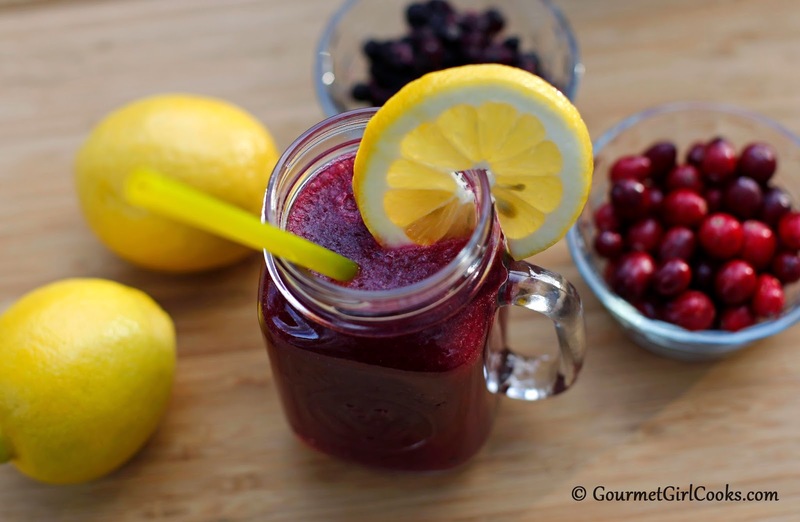 My Lemon-Berry Juice consists of frozen wild blueberries, fresh cranberries, fresh lemon (pulp included), water, ice and a simple syrup made with stevia. It was just amazing, plain and simple. I snapped some photos below as well as included my easy peasy recipe. Enjoy! 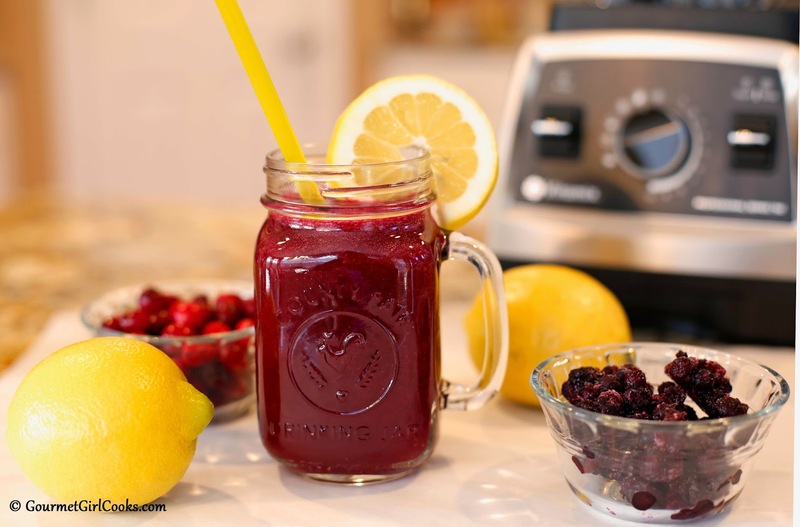 In a blender, add water, ice, lemon, blueberries, cranberries and sweetener. 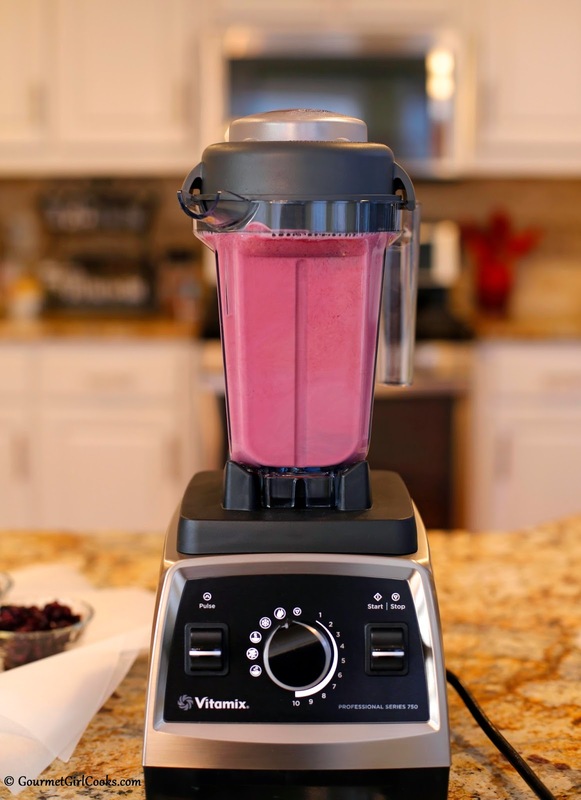 Cover and blend at high speed for 1 to 2 minutes or until smooth. *Note: If desired, 1 teaspoon of chia seeds can be added before blending. Approximately 7 grams net carbs and 5.5 grams sugar. 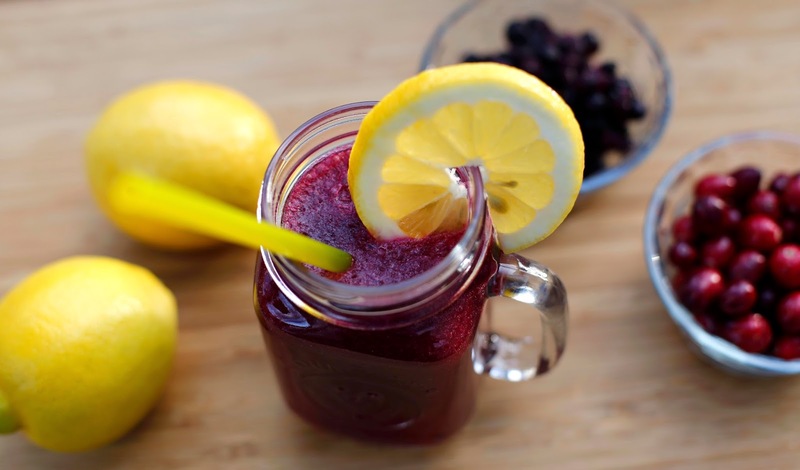 This juice looks positively awesome! I don't think I could possibly cram one more piece of equipment into my kitchen, though! (After rearranging a bit, I was able to fit the Zoodle Machine into the last few square inches of cupboard space!) So, do you think the juice could be made in the Magic Bullet and then strained if it seems too "pulpy" after blending? The NuStevia product is interesting ... I'll have to look for it. This looks absolutely delicious! 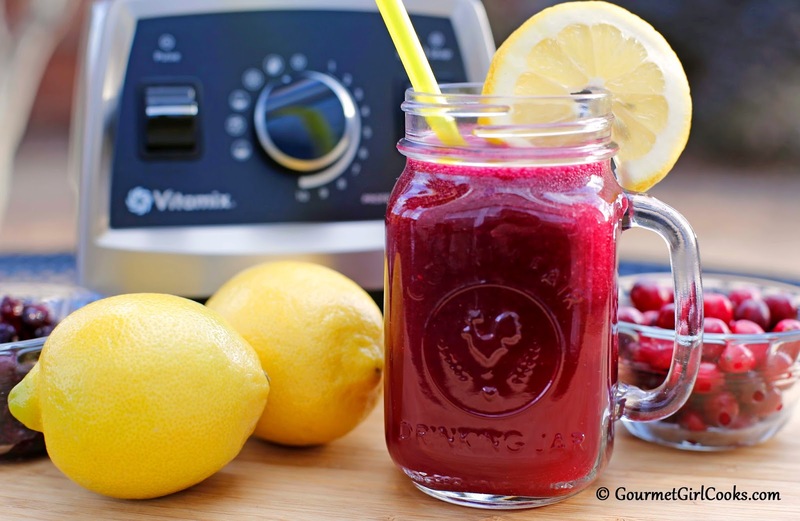 i have a new Vitamix that I have been experimenting with and I will be making this tomorrow. Thanks! I was surprised they contacted me and didn't know they even knew Gourmet Girl Cooks existed. Yes, the Magic Bullet should work. 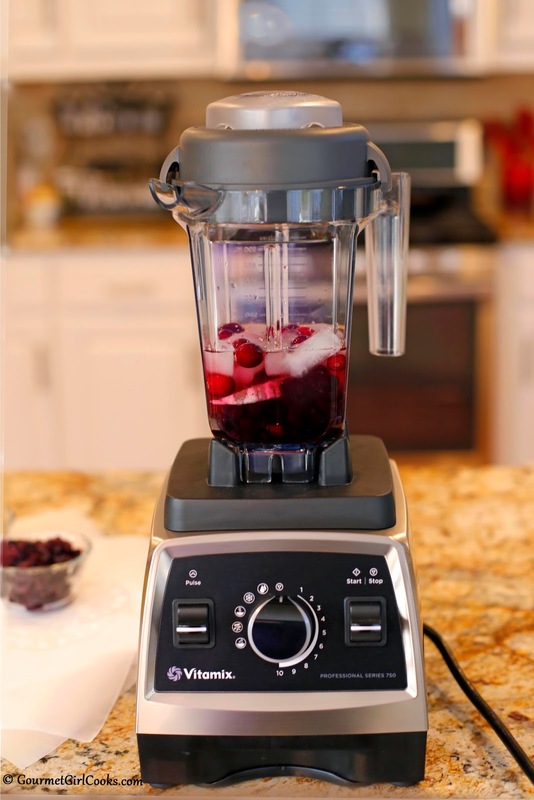 The main thing is I might use crushed ice instead of cubes so you don't mess up the blades. Does your refrigerator by chance make crushed ice? If not, you can bang some with a rolling pin in a Ziploc bag. Also, maybe chop the pieces of lemon up in dice size instead of larger chunks. I just peeled the lemon like an orange (removing the pith, etc.). I had never peeled a lemon before today! LOL By adding the lemon flesh and not just the juice as well as the ice, it gives it a little more substance...not a smoothie quality but more like an "Orange Julius"...do you remember having those? They used to be in a lot of shopping malls. I'm sure either way you get the lemon out of it's skin would work fine. Not sure if you ever buy lemons from Costco, but they were unusually beautiful today so I bought a bag of them. They are unusually juicy. I will make sure to use them in the days ahead for marinade, too. 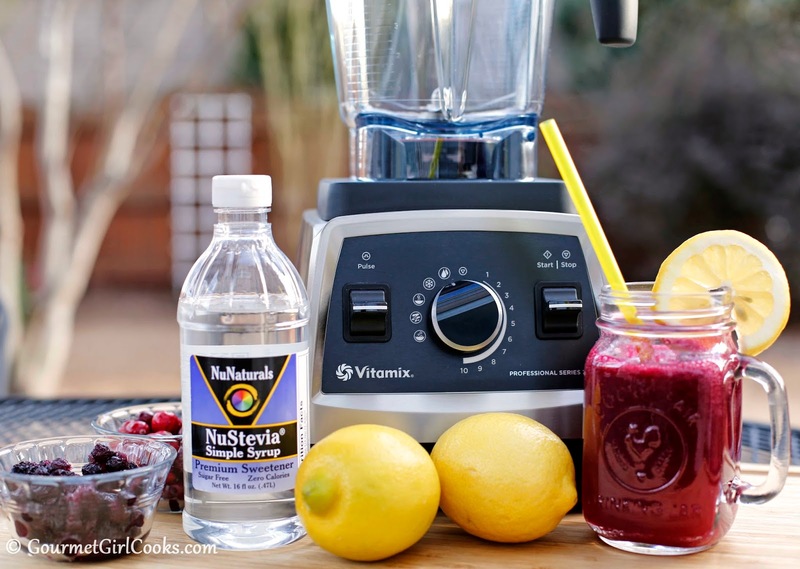 Will have to try this on my Magic Bullet too. I don't think we have that Stevia syrup here in Australia, will try it with just stevia sugar. That drink looks pretty good! FYI,there is actually a orange julius store in the frederick mall!I saw it a few months ago and had to have one! It reminds me of going to landover mall and getting those as a kid! Still tastes great! THANK YOU! 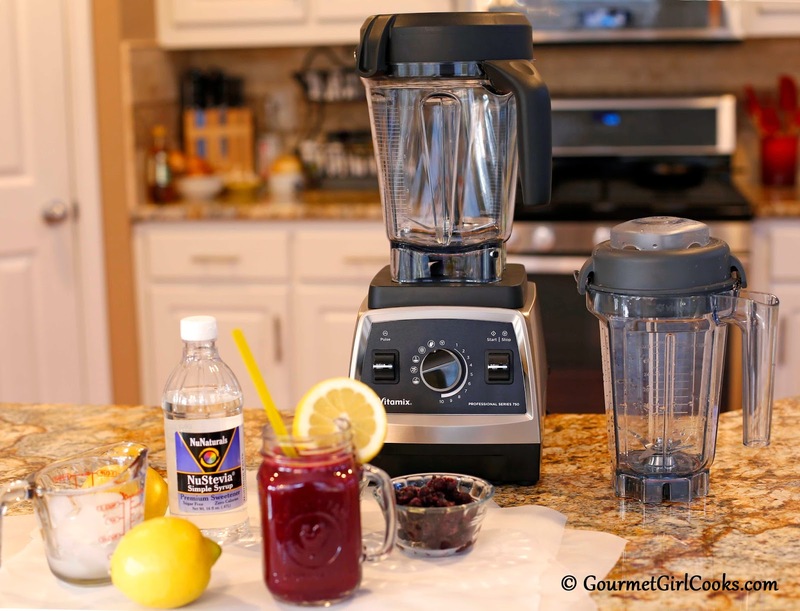 I am also a sugar free low carber and my brand new blender JUST came off the Fedex truck!! And I am so glad I scarfed up those cranberries after the Holidays!